Helping Catholics in our Archdiocese give their charitable giving eternal life. As Christian stewards, we are called to share with the church the blessings God has bestowed upon us. How we share them, however, can make a huge difference. The Catholic Community Foundation assists those in the Archdiocese of Indianapolis compelled to make the most of their sacrificial giving. We help them establish and give to endowment funds for Catholic parishes, schools and ministries in our Archdiocese. These gifts create legacies, producing annual income that will last long after the donors have gone on to seek their Heavenly reward. Over 30 years of service to others. The Catholic Community Foundation was established on June 25, 1987, as a resource for ensuring the long-term financial stability of Catholic parishes, schools and ministries in the Archdiocese of Indianapolis through endowments and legacy gifts. At the time of incorporation, the late Archbishop Edward T. O’Meara served as chairman of the board. As a nonprofit foundation, the Catholic Community Foundation is guided by Archdiocesan spiritual leadership and managed by a board of trustees, composed of lay professionals. Since 1987, over 470 endowment and donor-advised funds have been established. 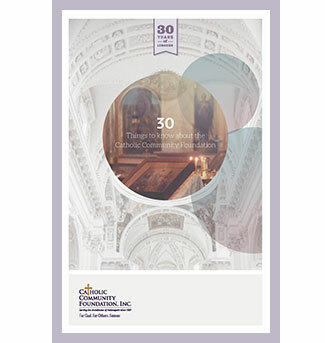 Click here to download 30 Things to know about the Catholic Community Foundation.